Thetford Corporation, headquartered not far from our own Michigan facilities, has been an Aero customer for many years. Thetford manufactures toilets and accessories for boats, trucks, and RVs. We mainly help them with storage, kitting, and distribution of their promotional materials. We send these pieces to retail locations and Thetford representatives worldwide. 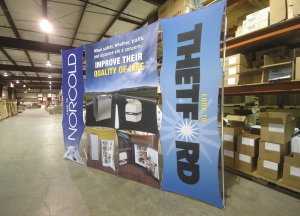 We also store and send Thetford’s displays for trade shows and other events. It’s our responsibility to inspect each display upon its return from an event. We then inform Thetford if repairs will be needed before the display’s next use.